In order to grasp the spiritual significance of the birth of our nation, it must be understood that the Unites States Declaration of Independence and Constitution were the first documents of their kind in the history of mankind. Up until this time, men had always been governed by royal, papal, or tyrannical edict. The laws they followed were given them by others. The radical concept of people governing themselves was absolutely unheard of. The birth of American style freedom was an extremely spiritual thing done by spiritual men. They spent many months and went to great pains to anticipate every eventuality that could possibly befall the fledgling nation. An attack on the foundation of our laws, the Constitution, is an attack on our national soul, the very essence of what makes us Americans. If one takes the single hour required to read the founding documents of the first Constitutional nation ever conceived, the entire political discourse of our day becomes maddeningly apparent. That is correct, it wasn’t a typo, we were the first, the prototype, for the notion of modern nationalism. Though anyone who has traveled abroad has seen many stately, even ancient, buildings and cities, what he has not seen are old governments. In terms of architecture and history, we may be very junior compared to our European neighbors, but in terms of government we are the venerable forerunner of the entire modern world. 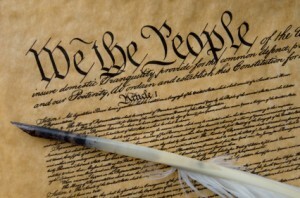 The American Constitution is the oldest written national framework of government in the world. The principles outlined in this document have guided the Constitutions of most of the, nearly two hundred, nations of our planet. When one tampers with the United States Constitution he is, in effect, tampering with the source document of the governance of the entire free world. So one must ask; where is the moral authority for such an important document? Needless to say, he was excoriated for this position. Those of us old enough to have been engaged in the Clarence Thomas Senate confirmation hearings watched in disbelief as the left tried to create a puerile case for rejecting this brilliant jurist on the basis of accusations that are, frankly, beneath the scope of this discussion. Clearly, the attack was motivated by their disdain for his adherence to both his faith and common decency. Justice Thomas is a Godly and noble man. Unfortunately, neither attribute holds any value in the minds of his hopelessly confused attackers, who continue to ridicule both his enormous intellect and genuine honor, even today. Perhaps it is fitting that such a dignified jurist remains an object of derision for those who have no comprehension of his understated elegance. No matter how you cut it, you just can’t buy class. So, what does all this have to do with current events? Well, the concept of Natural Law is not nearly as esoteric and distant as it may, at first, appear. In fact, the entire battle that we see being played out in the political arena on a daily basis is, in effect, being waged over the concept of whether or not civil law must recognize the concept of natural law. One need only flip the remote control between cable news networks in order to witness the battling ideologies. On the contrary, in the mind of the Progressive, law must evolve along with man, free from the constraints of such arcane concepts as good and evil, which he perceives as fungible human constructs. He recognizes no intrinsic moral rudder in the heart of man. Consequently, he feels that it is the responsibility of the government to steer humanity to its best end. He seeks not so much to restrain the criminal from that which he must not do as to coerce the law abiding man into doing that which he must. To this end, the progressive mind is constantly involved in using the law for the process of social engineering. This is the very core of the argument over terms like, “unconstitutional” or “living document” or “strict constructionist” which seem to dominate our news cycles these days. Clearly, the founding documents are underpinned with an explicit recognition of the Judeo-Christian ethos of Western Civilization. Since this fact is unchallengeable, the progressive argument seeks to attack the relevance of the founding documents rather than their content. An excerpt from Mr. Bianco’s timely and poignant upcoming new book, It’s the Devil, Stupid. Sorry, Val, but the presumption in your opening paragraph is contra-factual: “The radical concept of people governing themselves was absolutely unheard of.” What about the democracies and republics of antiquity? What about the city states of Tuscany during the high Middle Ages? By the second paragraph, however, the essay gets on track, and is well worthy of reading. doctrine of our founding fathers. truly moral form of government is the American one. none of them are immoral per se. claims purely under Natural Law … and won ? the only one convinced of the wiseness of doing so. entities…. voter ‘registration’ for example. wants / desires to live in the Welfare State. Aquinas analyzed Natural Law in his Treatise on Law. Natural Law … in our consciences. a signed warrant or affidavit by an injured party. See Blackstone.